Wine-ing Allowed at France UnCorked! 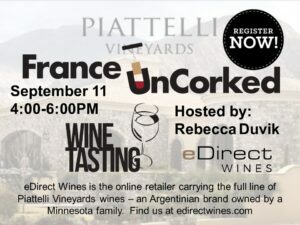 This month's France UnCorked is being hosted by Rebecca Duvik from eDirect Wines, the online retailer that carries a full line of Piattelli Vineyards wines (an Argentinian brand owned by a Minnesota family). If you aren't familiar with Argentinian wines, you'll be pleasantly surprised at the value ($15-30/bottle) and quality. Most of the wines are rated 90+ points by wine top critics and most are red dry wines, meaning they are oaky and fruit forward without being sweet. Rebecca will have samples of: Malbec, Cabernet, Red Blends, Cabernet Franc, Merlot, Rose, Ancellotta, Torrontés and Chardonnay. 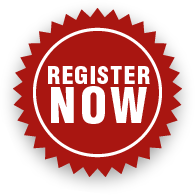 We hope you can join us for networking next Tuesday. Sounds like France UnCorked will be a tasty experience this month!